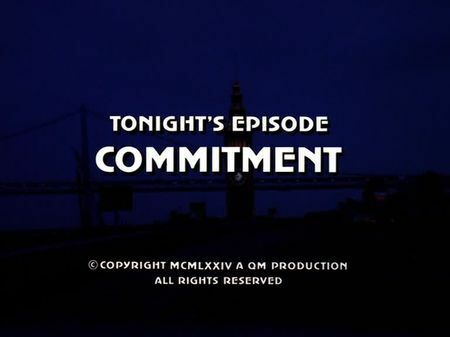 The screencaps for Commitment are now accessible on the episodes' page. Mike Stone has to face a set-up, perfidiously arranged by mobster Al Lyman, framing him in the murder of undercover cop Gino Carlino. Jeannie visits her father whenhe is told to meet Carlino by the waterfront in regard to a 12-year old unsolved murder case that Stone investigated at that time. Mike gets knocked off at the docks, and Carlino is shot to death with Stone's gun. Hot-shot internal affairs Inspector Glenn Decker puts a puzzle together, suspecting Mike of corruption and murder. Jeannie gets also involved when Lyman's henchmen fake a bribe money handover to her at Fishermans Wharf, knowing that police is observing the the bearer involved. Steve tries to convince Decker of Stone's unconditional loyalty but has to do more than just talk - so he finally tems up with Decker in order to uncover the truth. The involvement of informer Cappy who was connected by Steve, and the death of another henchman of Lyman's leads them to corruption inside the SFPD. This episode starts at Ferry Plaza by night. Later on, Mike is being guided to Pier 34 where he is being knocked unconscious and Carlino shot to death with Mike's gun. Several sequences were filmed inside and in front of Mike's house on Potrero Hill, and the chase with Lyman's henchman Denny Miller leads us from Potrero down to the Industrial Harbor (with a stop-over at 17th and Kansas Streets where Mike makes a call to Decker's office). Jeannie is lured into the bribe money trap at Hyde and Beach, and Steve meets informer Cappy downtown at O'Farrell and Powell, whereas Baxter's appartment (who is shot down on the rooftop by Mickey Sims) is located at Market and Guerrero. Soon after, Steve and Decker can book Sims and Miller in a mansion in Pacific Heights (with that great panorama view of the Bay through the window), and the climax was filmed inside and in front of the Davies Campus of today's California Pacific Medical Center at Duboce and Castro.